The Fairmont Scottsdale Princess held its inaugural “Christmas at the Princess” celebration to usher in the holiday season in 2010. The tradition continues, bigger and better, each year. It is an all-ages event with marvelous lights, ice skating and a train running through the resort. 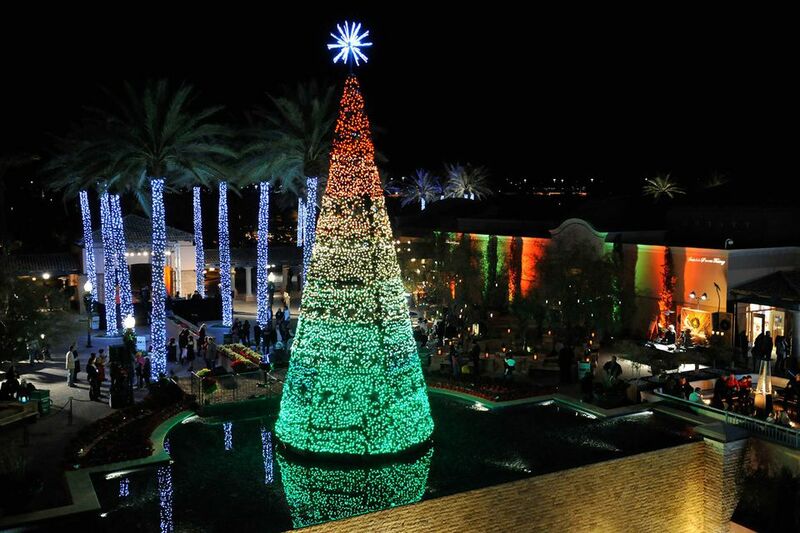 You'll find the festivities at Princess Plaza at the Fairmont Scottsdale Princess. That's northeast of the intersection of Frank Lloyd Wright Blvd. and Scottsdale Road in North Scottsdale. There are charges for parking. Celebrate the joy of the season at this AAA Five Diamond award-winning resort as it transforms into an enchanting winter wonderland during the Christmas at the Princess festival November 20, 2018, through December 30, 2018. With so many special events, the hours will vary each night and it's best to check the resort website for updates. It is recommended to go early in the season, and early in the evening to avoid peak-time crowds. The entire resort is lighted and open to the public. You can enjoy the more than 4.5 million LED lights as you stroll through the resort's majestic lagoons. Displays include swans floating on the water, buccaneer pirate ship, mermaid, 14-foot poinsettias, teddy bear, toy soldiers, fishing Santa, leaping arches, Nessie the 30-foot Loch Ness Monster, menorah, dreidels, 3D whale, skating penguins, candy cane forest, and more. The Princess Express trains offer rides around the resort's lagoons. You'll need a paid wristband to get into the train station. You'll encounter special characters throughout the resort. Meet Graham, Shivers, Princess Noel & Angelica, Selfie Elfie, and Peppermint Penguin as you stroll through the property. The public can go ice skating at the Princess. The resort’s 6,000 sq. ft. Desert Ice Skating Rink provides skaters the opportunity to skate surrounded by the beauty of the desert and clear night sky, along with magical rink-side "snowfalls" nightly. The cost of admission is $20. Add in skates for an additional $5.00. If you want a special skating experience, you can rent fire pit tables with s’mores and blankets for the evening. Santa will be at his Secret Headquarters where you can have your family's photo taken (fee). Reservations can be made online. Photos are available for immediate pick-up. Santa’s Secret Headquarters welcomes children with all spectrums of special needs to a photo environment supportive of their sensory, physical and developmental needs. The event will take place prior to public hours from 3 p.m. to 5 p.m. through December 24, 2018. Christmas at the Princess is open to the public. Admission/self-parking on opening day only is complimentary; the rides and attractions are priced separately. General admission includes up to six Attraction Wristbands per vehicle and includes access to Princess Express Trains, Copper Canyon Village Light Show, Enchanted Plaza Experience, 4.5 Million Holiday Lights, Holiday Characters, Nativity Garden, S'mores Land Family Campfires, Christmas Carousel, Ice Slide, and Ferris Wheel. Additional fees apply for Photos with Santa, Desert Ice Skating Rink, Build-A-Bear Workshop, and Rink-side VIP Fire Pit rentals. Enjoy a meal and spend $75 per vehicle at any of the resort’s outlets, including Bourbon Steak, Toro Latin Restaurant & Rum Bar, La Hacienda, and Ironwood American Kitchen, and you can get complimentary General Admission and access to rides and attractions for you and your dining guests plus complimentary valet parking. Reservations are recommended. The resort is pet-friendly (pet fee). The Fairmont Princess offers other packages during the winter season including American Girl experiences to enjoy with your doll-collecting child.